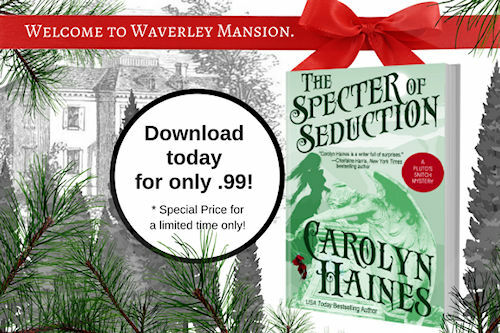 But enough scandal (always fodder for future mysteries), let’s talk about bargains and books. I have some hot deals for you today! TROUBLE IN DIXIE (Rebecca Barrett), TROUBLE IN TALLAHASSEE (Claire Matturro) and TROUBLE IN SUMMER VALLEY (Susan Y. Tanner) will all be on sale for .99 cents for a few days. THE SPECTER OF SEDUCTION (by me!) is also .99 cents. This is a very special after Christmas sale that will end January 8. So get the books while they’re cheap. And if you haven’t started the Trouble black cat detective series, the first one, FAMILIAR TROUBLE, will remain free until January 8. 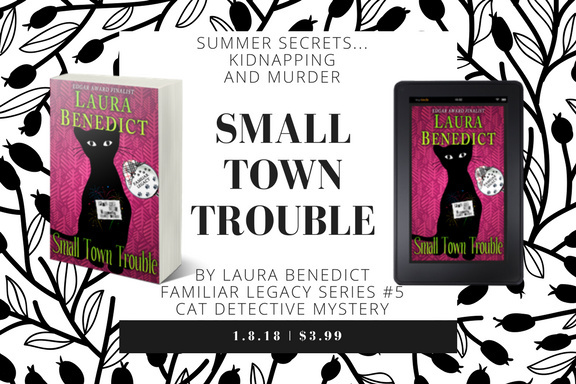 Also on January 8, the newest cat story by Laura Benedict, SMALL TOWN TROUBLE, goes live. So you’ll have mysteries to solve and more Trouble than you can handle. I’m so excited by this series and the quality of the writing from all of our contributors. And we have 2018 lined up with some really good writers—and a few repeats! I have a young dog here that I’m giving a break from the vet clinic. He’s looking for his forever home and his name is Velcro. 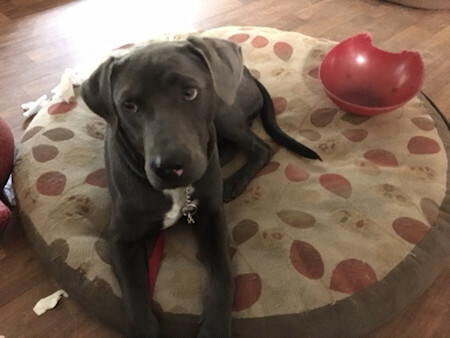 He’s part lab and looks to have maybe a bit of Weimaraner, maybe Dane and pittie in him. He is sweet and gentle and a good watchdog. He’s about a year—heart worm negative. Has all his shots and is neutered—thanks to Dr. Lynne Leonard. He’s a very good boy and doesn’t seem to have any serious vices. I’m socializing him with my dogs and cats and he seems to be a really great guy. Take a look and if you have a place in your home for a loving pet, drop me an email or PM me on Facebook. I hope you all had a wonderful holiday. I went to my former sister-in-law’s and had a lovely time. Janet and Ed Tessier are always kind to invite me and my brother, David. My family is small so there aren’t a lot of large gatherings over the holidays. We may be small in number but we are mighty in raising hell! Santa was good to me—especially since I get to play Santa and play me! I decided I was very, very extraordinarily nice—and I got a new computer, which I desperately needed because my old one was 10 and I feared it might keel over any minute. That’s about the shape of the season at Casa Carolyn. 2018 is just around the corner. Impossible to believe. My grandmother came to this country around 1896 when she was six years old. She married and was raising children in the 1920s. My mother was born in 1926, the last of her children. How can that be 100 years ago? I do sometimes wonder what Grandma would say about computers, cell phones, etc. Fascinating. So ring in the New Year with high expectations and good cheer. Happy Holidays from the farm and all the critters here. But wait — there’s more! SURPRISE! I am giving away 10 gifts to my readers! Please click on this: Christmas Bonanza Giveaway.